Daniel Padilla reacts to being a shoo-in for this year’s blockbuster king. Even with their hectic schedules, Daniel Padilla still made time to show support for Kathryn Bernardo’s latest Kathnails branch opening in SM Southmall after flying back to Manila last September 10. “I’m very proud and siyempre masaya dahil alam natin na yung mga earnings niya ay napupunta sa tamang lugar at nagagamit ng tama kaya andiyan din si Tita Min (Bernardo) who is a very good businesswoman and the family to guide Kathryn. Well sino bang hindi magiging masaya ‘di ba? Pang-limang branch na and talaga naman ng branches ng Kathnails ay very successful. So thank God,” he shared. 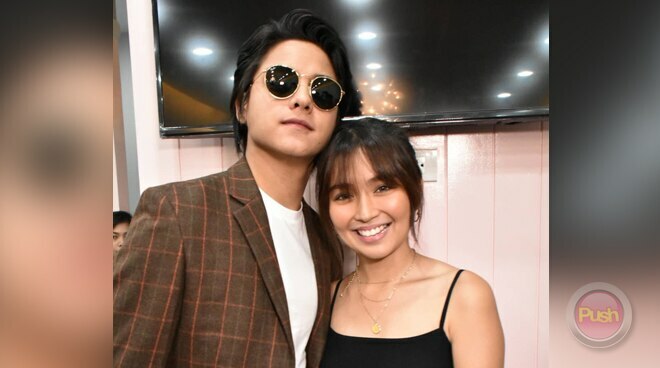 Apart from their successful independent business ventures, DJ said he is very happy with all the positive feedback on their film The Hows of Us. “Ako overwhelmed. Siyempre lahat ng pinagdaanan ng the making of The Hows of Us, grabe din yung pinagdaanan namin doing the movie, emotional and physical grabe. Mentally din. Sobrang overwhelmed na ganito yung kinalabasan nung pelikula. We all know the power of word-of-mouth and I’m just very proud of the movie. Yun lang. Very proud ako na ang daming na-touch, ang daming naka-relate. Kahit mga kaibigan ko, mga tito ko, natatawa na lang ako pero yun yun eh. That’s the point of making a movie di ba?” he said. Even with The Hows of Us reaching the P500M mark, DJ said he and Kathryn are not going to let themselves think about becoming this year’s box-office king and queen. “Hindi pa namin iniisip yun. Hindi naman namin iniisip yung mga ganun. Proud lang kami and very happy sa kinalabasan nung pelikula. Si direk Cathy (Garcia-Molina) ang bigyan natin ng box-office queen (laughs). Lalo na lang tayo ma-excite sa mga susunod pa niyang gagawin,” he added. As for having time for rest and a much-deserved vacation, DJ said he is still finalizing plans with Kathryn to visit a white beach in Ormoc City that is currently being compared to the beauty of Boracay island. “Wala pa. Hindi pa tini-treat kasi hindi pa rin tayo tapos. And still nagtratrabaho pa rin kami para sa pelikula so siguro after that. You know we all love the beach so dun muna para makapahinga. Hindi (Amanpulo). Mahal dun, ubos pera mo dun (laughs). Hindi ko pa alam kung saan. Wala pa rin kaming maisip, parang ang hirap. Pero alam mo yung Kalanggaman island parang gusto namin i-spot-an yun,” he said.